The Reader is not recognized by the computer or the Reader software. Note: Because each of these steps represents a possible solution to this problem, open the Reader software and connect the Reader Digital Book to the computer after completing each step. Turn your Reader Digital Book off and then back on again. Make sure you that you are using the Reader for PC or Reader for Mac software. Note: These models are not compatible with the Reader Library software. 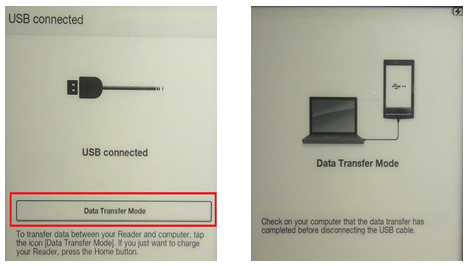 PRS-T1: In the USB connected screen, make sure you tap the Data Transfer Mode icon so that your Reader goes into Data Transfer Mode. PRS-T2: In the Do you want the computer to recognize this device screen, make sure you tap Yes so that your Reader is recognized correctly. If the problem persists, close the software, re-open it, and then check the connection status again. Verify that the Reader Digital Book battery has an adequate charge. Note: If the battery is discharged, allow the battery to charge for at least one hour before attempting to connect the Reader Digital Book to the software. Verify that the Reader Digital Book is turned on and is not locked . Verify that the USB cable is properly and securely connected to the Reader Digital Book and the computer. Note: The USB cable should be connected directly to the computer. 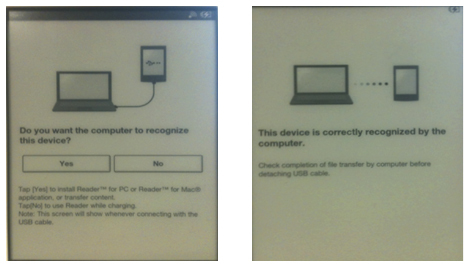 Connecting the Reader Digital Book using a USB hub or extension cable is not supported. Verify that the Reader Digital Book displays the USB connection indicator in the upper-right corner of the screen. Remove any Memory Stick® media or SD media in the Reader Digital Book. Disconnect any other USB Device except for your Keyboard, Mouse or Wireless USB transmitter. With the Reader Digital Book connected to the computer, uninstall the USB driver. After you uninstall the driver, disconnect and then reconnect the Reader Digital Book back to the computer, allow a few moments for the driver to reinstall and then check the status. IMPORTANT: After doing a Hard Reset, it will be necessary to authorize your unit again. If possible, install the Reader software on a different computer and connect the Reader Digital Book to test. The troubleshooting steps listed above should resolve your issue. If you have completed all of the steps and the issue is not resolved, service may be required. How to resolve when the IC recorder is not recognized by the computer? How to resolve when the portable player is not recognized by the computer? How to resolve when the reader cannot be turn on? How to resolve if the portable audio player is not recognized by the computer? How to resolve if the computer does not recognize the player?